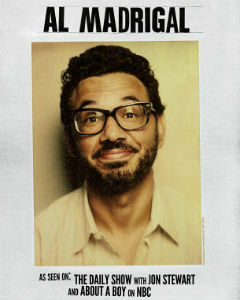 Al Madrigal’s unique and lyrical delivery makes him more than just a stand-up comedian, but an expert storyteller. A fan-favorite on the Emmy® Award-winning The Daily Show with Jon Stewart, Madrigal’s regular contributions as correspondent have led to numerous scripted television guest spots, including Welcome to the Captain (CBS), Gary Unmarried (CBS), The Ortegas (FOX), and The Tax Man (FOX). Most recently Al can be seen co-starring on NBCs About a Boy with Minnie Driver and David Walton. As a stand-up, Al has starred in his own half-hour special, Comedy Central Presents: Al Madrigal, as well as having performed on Conan, The Tonight Show, Lopez Tonight, The Late Late Show with Craig Ferguson, Chelsea Lately, Jimmy Kimmel Live, John Oliver’s New York Stand-Up Show, Pretend Time with Nick Swardson, Comics Unleashed, and The 3 Non Juans. On October 1st, 2012, alongside comedian Bill Burr, he launched the All Things Comedy network – a podcast and video network founded, owned and operated entirely by comedians. On it, Madrigal and fellow comedians Chris Spencer and Maz Jobrani release weekly episodes of Minivan Men- a podcast for regular people with children.